I am a student at Brown University, and this is my blog! Most posts here are half-formed thoughts, notes for myself, and things I jot down while working on larger projects. For more developed and complete work, see my writing; for information about me, see my CV. If you have any comments, thoughts, or questions, please email me using the icon below! How salty has the sea been over the past 541 million years? This work by Aliosha Bielenberg is licensed under a Creative Commons Attribution 4.0 International License. Our trusted friend Wikipedia tells us that prior to 1927 the name of the modern village of Neo Monastiri was Τσιόμπα (Tsioba). This name appears to be the Turkish, based on the word çoban (Felipe Rojas, email correspondence, 2018) meaning shepherd, which is a fairly common component of Turkish place names. This name is also linked to a popular Turkish producer of Greek yogurt, Chobani. In 1927 there was a deliberate name change to Neo Monastiri. Where things get a little foggy is the progression of names prior to this change. The use and existence of Tsioba is documented below, but another name is noted in this source: Biclerer (Μπικλερέρ), also Turkish. There is also mention of the village being called Malamidohori in honor of the Fthiotida representative Efstathios Malamidas, who founded the village, though this name didn’t stick (1925). One reference was found to the toponym Hajoba as the name of the village prior to the arrival of the Bulgarian immigrants. As we know, the village was rebuilt after a 1955 earthquake, and now the former location is referred to as the “old village” (Paliohori). The toponym Neo Monastiri was directly transferred between places. Figure 1. A map from The Wars of the Nineties, courtesy of the Anne SK Brown Military Collection at the John Hay Library. The oldest known reference to a village toponym is from an 1897 map (figure 1) in the book The Wars of the Nineties, published in 1899 in London. This map shows the town of Tsioba in the correct location for Neo Monastiri based on comparison with the surrounding towns. From this, it’s obvious that there was a small village, as it was described in sources contemporary to the map, at the location prior to the establishment of the current community living there. One source writes that that itinerant shepherds or vlachs lived in the village for fifty years prior to their own arrival . There is a note that these names applied to older ‘settlements’, not villages, although no distinction is made between what that means, exactly. There’s no record of a Greek toponym in use prior to 1927, which is interesting given the array of possible Turkish names used prior to this time. Though the modern name of the site for archaeologists is “Koutroulou Magoula,” this is not a toponym which is either Greek or recognized by the local community. Rather the name Agripidia is better recognized and understood locally, as well as Varadli Magoula. This is directly referencing the location’s proximity to the town Varadli. Also, the term magoula is used as if it is the name of some topographical feature; on this note, see the later section on etymology. It’s also written that the site was called Hasapli in the past, and there was a well there named “hasapliotiko pigadi.” Apparently there is confusion over why the name Koutroulou is used, though it has several possible origins. First, there was potentially once a factory (later described as a slaughterhouse) on that location. The spring presently there supports the existence of this factory(ish?). Another story about the name origin is that the teller was taken by his parents to ‘the magoula’ when he was fifteen to see a medium because he had not yet gotten married. The medium said that the magoula had buried treasure, deep in the ground. Possibly a reference to the archaeological site? Unclear how Koutroulou connects there, but it certainly points to the area being called the magoula for a long time. Another point, relating to the word Koutroulou: there is a well in Vardali named Koutroulou pigadi or “to pigadi tou Koutroulou”. No meaning for the word is offered. There is an area just past the church on the edge of the village called Hatzaiamar, also known as Agios Georgios. 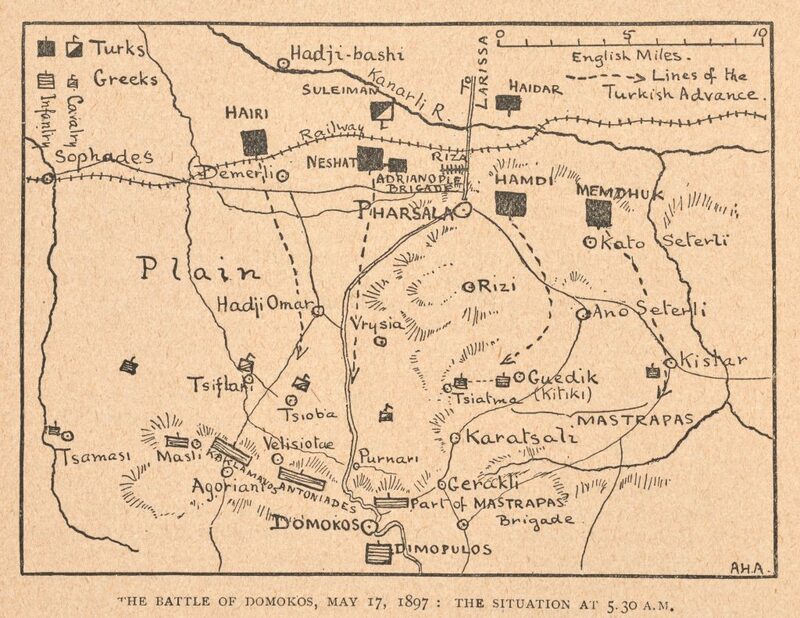 The area supposedly got its name from the deal of a man during the 1897 Greco-Turkish war, the same battle which placed Tsioba on the map (figure 1) referenced above. Our primary reference was Χαράλαμπος Π Συμεωνίδης, Ετυμολογικό Λεξικό Των Νεοελληνικών Οικωνυμίων (Λευκωσία ; Θεσσαλονίκη: Κέντρο Μελετών Ιεράς Μονής Κύκκου, 2010) [transliterated as Charalampos P. Symeōnidēs, Etymologiko Lexiko Tōn Neoellēnikōn Oikōnymiōn (Leukōsia: Kentro Meletōn Hieras Monēs Kykkou, 2010)].